Morgan S. on May 11, 2018 -- "We'll never forget such a great party, and Capital Celtic helped make it possible!" Steven of Capital Celtic was a huge help throughout planning our wedding, and was so responsive to all of my questions and needs. Capital Celtic was actually the first vendor we booked, after I had a great conversation with Steven about Irish music and what Capital Celtic could do for our event. My husband is Irish, so it was important to us to have a little bit of that represented in the music, and Capital Celtic delivered. They were willing to learn a few pieces specifically for our ceremony, the guests loved the cocktail hour Irish music, and we also hired Steven to provide DJ services for us during the reception. We had rain for the outdoor ceremony, but Capital Celtic played on! Throughout the night, Steven made sure we kept things moving. Though some things ran a little behind schedule and there were some changes to the sets day of, overall Steven was very communicative, reviewed our selections with us carefully, and was willing to be flexible with requests throughout the reception. He checked in with us throughout the night, making sure things were still going according to plan since our DOC was often absent. He also encouraged us to have a microphone for the officiant during the ceremony, acted as our reception emcee, and was mad busy the whole night--we appreciate all of his work. If I had it to do over again, I wouldn't pick any other group! If you're in the D.C., NOVA, MD area, I highly recommend Capital Celtic to help bring the party to life. Thank you so much for all of your help and enthusiasm throughout the planning and duration of our event, we'll never forget such a great party, and Capital Celtic helped make it possible! Erin C. on December 28, 2017 - "All our guests absolutely loved the live music"
From the first time we reached out to Steven and Capital Celtic through to our wedding day, they continuously exceeded our expectations. Steven was by far my most responsive vendor, answering questions quickly, bringing ideas and questions to our attentions that I had not thought of, and very flexible around our schedule and vision for the event. We had Capital Celtic perform live music during our ceremony and cocktail hour. All our guests absolutely loved the live music. I received multiple compliments on their performance. Steven continued the positive vibes through dinner and into dancing as our emcee. We had outlined a general timeline of events the week prior. He definitely helped everything move along as smoothly as possible which included navigating some hiccups caused by our venue. He was always checking in on us and our family to make sure we were happy with everything he was playing. Even though our wedding was a midday brunch, he still got people out on the dance floor. Overall a beautiful job by Steven and the rest of Capital Celtic. It was a pleasure to work with them and I would not hesitate to recommend them to anyone looking to add some Irish flare to your event. Thank you Steven! Gloria B. on October 21, 2017 -- "The band is super talented and sounded great." We loved having live Celtic music at our wedding reception as a tribute to our Irish heritage. The band is super talented and sounded great. We got so many compliments on the music and uniqueness. Colleen S. on October 3, 2017 - "Amazing!" Steven played at our wedding last week and he was amazing. He played guitar during cocktail hour, and his Irish trio performed during our ceremony. Everything was perfect. He was so accommodating and flexible and knowledgeable. During the lead up to the wedding, he was always easy to get in touch with and quick to respond. If you need ceremony musicians, Steven is your guy. I can't recommend him enough! Megan D. on September 3, 2017 -- "Highly recommend." Wonderful experience! So much fun for a family birthday party. Highly recommend. Krista E. on August 6, 2017 -- "They were perfect!" They were perfect! They set up early and played for two wonderful hours. We liked them so much that a number of the neighbors are looking into another event in the spring. The combination of reels and songs really helped make our memorial a festive event. Just what my husband wanted. Julia M. on July 13, 2017 -- "Highly recommend Capital Celtic to anyone looking to add some Irish music to their special day." ​We loved having Capital Celtic at our wedding! They learned a special song to play acoustic for our ceremony, and then they played fun, instrumental pub songs during our cocktail hour. They were so easy to work with and professional, and our guests really loved the Irish music! We would highly recommend Capital Celtic to anyone looking to add some Irish music to their special day. Pam G. on July 1, 2017 -- "It was a wonderful event and we will book them again." They were very pleasant to work with and everything went smoothly. The caller, Marilyn, was very good with my grandchildren and they were laughing and having fun, despite having no prior experience. The music was perfect for the occasion and the musicians were all very talented. It was a wonderful event and we will book them again. Colleen H. on June 19, 2017 -- "They were an absolute hit!" I can't say enough great things about Capital Celtic! They played our ceremony, cocktail hour, and reception through dinner and were an absolute hit. From the first time we spoke with them we knew they would be such an amazing addition to our wedding and they did not disappoint. Every song they played was perfect for the setting and we had SO many compliments from our guests on how great they were and how much they enjoyed hearing them play. Capital Celtic gave us exactly the feeling we were hoping to add to our wedding- from romantic and charming at the ceremony to fun and exciting at the cocktail hour to a killer fiddle solo during dinner (that guests were getting up from their seats to video), we loved every moment of their performance. Thank you SO much, Capital Celtic!!! Chris. O on June 10, 2017 -- Everything was smooth and I never had to worry -- which was awesome. Steve was completely professional and worked with me to structure his services perfectly for our wedding. The band learned a new song for us. They set up in three separate places as the wedding moved from sanctuary, to outdoors, to reception hall. He even let my friend, a guest of the wedding party, jam on his fiddle with them. Everything was smooth and I never had to worry -- which was awesome. Michael S. in Mt. Airy, Maryland on May 13, 2017 - Sound great! ​Playing at the Mid Atlantic Celtic festival under adverse conditions and still sounding great! Thomas P. on May 17, 2017 -- "Their music was beautiful and left all of our guests smiling and with a lifelong memory." Capital Celtic, and in particular their leader Steven O'Toole, were an absolute joy to work with. They accommodated our requests in every way, from arranging for a caller to lead our guests in traditional Ceilidh dances, to working with us on the budget, to being flexible with our changing schedule on the big day. Not only that, but their music was beautiful and left all of our guests smiling and with a lifelong memory. I wouldn't hesitate to work with them again. John L. in Arlington, Virginia on April 3, 2017 - A big hit! ​Capital Celtic was a big hit at a St Patrick's Day party at my house. We had more than 60 people ranging in age from 1 to 71. Everyone loved the music which included traditional Irish tunes as well as pub sing-alongs. I have booked them for my next event. Liz T. on March 22, 2017 - Above and beyond! We got married on St. Patrick's Day weekend, and there was no one better for our wedding music than Capital Celtic! They played the music during our church wedding ceremony, played live music during our cocktail hour, and then Steven was our DJ for the rest of the night. At every step along our day, they were perfect. Sean M on March 6, 2017 - Excellent performance enjoyed by all. Capital Celtic performed for our event this past weekend, which exceeded 1,000 attendees. They brought great energy, and the beautiful sounds of Ireland to our Irish themed event. It was a perfect fit. Steve was great about following up with myself and our sound company beforehand and the band delivered an excellent performance enjoyed by all. ​Saw them at at the Leprechaun Luau! They knew every song I requested. Great awesome fun band! Capital Celtics were in a word, phenomenal! My husband is from Ireland, and his mother was the only guest from his side who could make the trip. Having the Capital Celtics provide their beautiful, AUTHENTIC, Irish tunes was the greatest gift! They were extremely professional, and kind whilst arranging the songs to be played for the ceremony and cocktail hour. The BEST part...they offered to learn a Fleetwood Mac song for us to dance to as our first dance! We had a wedding better than we could have ever dreamed of thanks to the Capital Celtics. You will not be disappointed by having them provide the music for your big day. They will work hard to make sure you get everything you want out of musical entertainment. Steven, the band leader, is wonderfully kind, as are his partners! They were very expedient and accommodating to our budget, and we were so happy to have them join us for the reception after their performance! I couldn't recommend them highly enough. Patrick O. on December 18, 2016 - Recommend them! They were great! Recommend them! Kristen G. on November 2, 2016 - Amazing! I recently heard Capital Celtic perform when I was photographing a wedding in VA, and they were amazing! The sound was just beautiful. It added such an amazing vibe to the cocktail hour! ​I saw Capital Celtic at the Herndon Depot on a beautiful fall day, the celtic sounds wafting through downtown Herndon. This is one tight trio playing some great traditional Irish music.The only thing missing was a Guinness in my hand. I look forward to seeing them again. If you enjoy Irish music you should make a date to check them out! Lin C. on October 7, 2016 - Energetic music! Just saw them at Fiona's Irish Pub in Alexandria and hope to hear them again soon. Very toe-tapping energetic music! Michelle J. on September 26, 2016 - Spectacular! I saw Capital Celtic open for another band this summer and hired them for my own event this past weekend. They are spectacular! They have a massive amount of songs in their repertoire and it's an absolute joy to hear them play! I got tons of compliments on the band from folks at the event and I couldn't be happier. It was a true pleasure to work with Capital Celtic and be able to listen to them play for a couple hours. Issa K. on September 24, 2016 - Extremely pleasant and approachable! An Amazing band that plays enchanting tunes! The charm is that it not only heralds a sound of the present but a feel from the past! The troupe themselves are extremely pleasant and very approachable!!! Just saw these guys at John Strongbow's Tavern. They were great! Lots of talent and played a ton of songs I knew. Ken V. on August 25, 2016 - Highly recommend! I highly recommend you book Capital Celtic for your next event! Very professional, with a great mix of Celtic music, that will keep your hands clapping and toes tapping. You will not be disappointed!! The band is extremely energetic and interactive. After visiting Ireland, they brought back many great memories. I highly recommend spending an afternoon or an evening seeing them. My friends and I watched them perform at Hunters Mill Winery...very relaxing and fun afternoon and atmosphere. ​Capital Celtic recently played at a wedding celebration, which the bride and groom were from Ireland. They did an excellent job of meeting their needs and learning their special song requests. Despite the heat, it turned out to be a perfect day with AWESOME music played by Capital Celtic. Greetings! I recently retained Capital Celtic for a Summer Solstice celebration at my house this past week. It is with great pleasure to report their music and vocals imbued the event with beauty and magic. Of the almost 20 people in attendance I cant think of any that failed to remark how much they loved our music. One of the singers would even give my all time female vocalist Loreena MvKennit a run for her money. I strongly recommend this excellent band to everyone who enjoys real Irish music and unearthly vocals. Michael Gast, Esq. Patrick D. on June 1, 2016 - All I can say is WOW! ​Wow! All I can say is WOW! This band was great and they knew just how to cater their amazing talents and music to match the setting. They were right on time and very professional. They were able to happily interact with a diverse crowd of people and made our event truly special. I would hire them again in a heartbeat. Thanks to everyone at Capital Celtic! John R. on May 29, 2016 - Made the evening a success! ​Was more than pleased hiring this band to play traditional IRISH MUSIC .they had a tough crowd ( family and friends) of first generation NY Irish who were well entertained and made the evening a success! Will definitely hire them again. Sean M. on May 27, 2016 - Nothing short of phenomenal! ​Capital Celtic have been playing as apart of the Kennedy Center's IRELAND 100 Festival and they have been nothing short of phenomenal! They are so easy to work with and very gifted performers. Staff and patrons alike have been sending our department praise for having Capital Celtic as a part of our programming. We look forward to their third performance next week and would recommend them to anyone looking for a great Irish band! ​Perfect! Everyone that attended told me that it was a fantastic event, and the band was the best. Thanks again for the great music. Your group is super professional and I'll certainly pass the word along. ​Capital Celtic made a our visit the winery great. Good music and fun. ​​I watch for this group's winery gigs. Always a fun time. My favorite is the "whiskey in the jar" song. ​A good time. They keep us coming back. ​Overall experience was wonderful. Capital Celtic were great and made the party special. They were professional, their music was fantastic and our guests loved them. Look forward to having them again! ​Capital Celtic played for my father's birthday in December and they were fantastic. Everything about the experience was wonderful, from booking to setting up to the actual performance. I found them incredibly easy to work with and wonderfully professional. Their set was energetic and fun - they played mainly Irish music with some more classic songs mixed in. They kept the crowd engaged and everyone thoroughly enjoyed them! I was very happy with my choice. Michelle T. on March 21, 2016 - Engaging, authentic and fun! ​Capital Celtic was booked by us to perform at a post-race after party. Their music and performance was engaging, authentic and fun! ​I listened to Capital Celtic at Dirt Farm Brewery for the first time today. It was snowing on the mountain; the cool winter air encouraging everyone to step inside for warmth, beer, and music, and the music playing was performed by the trio of Capital Celtic. Being partly Irish myself, I enjoyed the Celtic tunes that filled the room with a fun and energetic vibe as I drank with my friends. I highly recommend them. Doug C. on March 17, 2016 - Love the tunes! ​​Great time celebrating St. Patrick's Day at Clyde's Willow Creek Farm with Capital Celtic! Great crowd and lovin' the tunes! ​​Music was authentic and made us feel like we were back in Ireland. Really enjoyed ourselves!!!!! ​​Was at clydes tonight for St Patrick's Day! What a great show. Group even dance, very beautiful women dancing and great band. Clydes brambleton was rocking. ​Great music,fun, personable. Of wait, that's definition of Irish! ​​Winchester Celtic Fest- amazing band: all three members are talented musicians in their own right!). Thoroughly enjoyed! ​​Saw these amazing musicians at Union Jacks on March 12th for my birthday. (And the Celtic Festival) Such a fantastic way to enjoy my night!! Thanks yall!!! Jim R. on March 12, 2016 Fantastic! ​We are at hunters run winery. The band is fantastic! ​We saw Capital Celtic at Nanny O'Briens on March 11th. They were great. They were entertaining and really engaged the crowd. I really enjoy Celtic music and specifically enjoy listen to the flute being played in a prominent way. It's normally such an underrated instrument. Great job, guys! ​​They're killing it at Nanny O'Briens in Cleavland Park. Every song was spot on and really brought the Irish vibe. Loved it. ​Capital Celtic performed in our Assisted Living unit during a family night celebration for St. Patrick's Day. It was a wonderful performance, enjoyed by residents, family, and staff! ​​The performance was awesome and the residents enjoyed the interaction, gifts and the stories you shared. We cannot wait to bring you back in the future. ​This band has played on many occasions at the Great Falls Farmers Market under all kinds of weather and other conditions. This is a wonderful band to work with. They are responsive. They keep their word. The musicians are great with a wide array of songs. They endure under difficult conditions. They keep the spirit moving! It is a delight to enjoy their performances. You are welcome to come by and hear them perform, when scheduled. Lovely traditional Irish tunes played in a way that works in both small, intimate settings, as well as larger spaces. If you're having a wedding or other event, highly recommend you give them a listen. Karen C. on January 17, 2016 - Fabulous trio! ​​Capital Celtic provided the perfect background music for the birthday party of our brother/father who is an Irishman at heart! ​​My wife and I enjoyed a terrific afternoon at Hunter's Run Winery on November 21st listening to the wonderful Irish music provided by CAPITAL CELTIC! We are looking forward to hearing them play again at O'Faolain's Pub in Sterling on December 17th for the Ancient Order of Hibernians Christmas Party! ​I was exceptionally impressed by Capital Celtic at the Hunters Run Winery on 21 November. Their selection of tunes was superlative and the level of musicianship was at the highest quality. The violin and flute luxuriated the ears and all songs were beautifully sung. It definitely can take you to the shores of Ireland. Magnificent and highly recommended! ​A great time at Hunters Run Winery on 11.21.15 with Capital Celtic! The wonderful sounds they provided, and the festive mood they created were the perfect compliment to, if not the catalyst for, the warm, friendly and inviting atmosphere of the Wine Tasting Barn. ​​Enjoyed a fabulous autumn afternoon Novemer 21 at Hunter's Run Wine Barn listening to Capital Celtic. Great music performed by musicians who clearly enjoy their craft - a perfect accompaniment to the delicious wine and glorious weather! ​​What a fantastic trio! Their traditional music makes you feel like you're right in Dublin! Great fun! Fantastic music! Another pint, please...I'm staying! Capital Celtic played beautiful instrumental Irish music at at our event and it was enjoyed by all of our guests. Geri N. on October 6, 2015 - Irish all the way! Irish all the way! Finally, a group that actually plays, knows, and sing some great Irish songs and tunes. Capital Celtic plays at our winery once a month and we cannot be happier. We are a truly Irish owned winery here in Northern VA and are delighted and honored to have such an amazing group play here at Hunters Run Winery. They have such a vast play list ranging from old ballads, to pub songs , to a good old fiddle session. They remind me of home each time I hear them. Steven is very engaging with the crowd and our customers just love him, and the 2 ladies that play with him. They play fiddle, acoustic guitar, flute,and mandolin. What more could you ask for. They are easy to work with, can adapt to any environment, and are a pleasure to work with. There was beautiful music wafting through Dupont Circle last night and it was coming from Capital Celtic playing at James Hoban's restaurant. The instrumentals were hauntingly lovely and we enjoyed their harmonies also. Look forward to see them again! I saw Capital Celtic at James Hoban's in Dupont Circle. Great to see a talented, dedicated group like this playing traditional Irish music. I was in Dublin just a few weeks before and they made me feel like I was back. 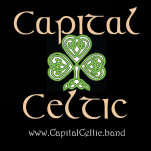 I saw Capital Celtic in concert at O'Sullivan's in Herndon and they put on an excellent show! A lot of classic Irish songs, a few fun contemporary covers. A very enjoyable evening with great beer drinking tunes! The guests (especially the Irish) at our event loved the band and the music helped create a nice ambiance that allowed people to socialize or sit back and be entertained at their leisure. A beautiful and authentic acoustic set! Beautiful music with a great deal of feeling. Steven Toole and his Capital Celtic band have been coming to play music at O'Malley's for a few weeks now and they have been nothing but great. Not only are they a pleasure to work with but the music and atmosphere they provide is great for our guests. I have had numerous compliments on them from guests throughout the times they have been here. Great band, very enjoyable evening! Rich sound, in the band with guitar, violin, mandolin, flute and vocals. A very cool irish folk vibe, not only the music but the atmosphere they create - makes you feel like you are in a small town pub in the old country. Steve Toole and the band, Capital Celtic, have a sound reminiscent of the streets of Dublin, to be sure. Their familiar melodies and cheerful tunes had plenty of us at O'Malley's bar singing along long before the sing-along began! Now if only I could dance a jig!